During the presidential campaign, Republican challenger Mitt Romney said Obama had waged a war on the coal industry during his first term. The reality is more nuanced. Coal production has dropped swiftly, but that's due to a mix of factors, including a U.S. natural gas boom that's made gas a compelling energy alternative. The recession has also dampened demand. The coal industry will see more regulations take effect in 2015, but many of those rules were written before Obama took office. A second Obama term will likely make coal exploration and combustion more expensive over the next four years, as experts expects he will be even tougher on the coal industry. Investors had been holding out hope that a Romney win would be a boon for the industry, since many felt he would try to find a way to untangle some of those regulations. "Romney was quite clear about the need for coal use and coal exploration, while Obama is viewed as more friendly toward environmental regulations," said Dan Greenhaus, chief global strategist of BTIG. 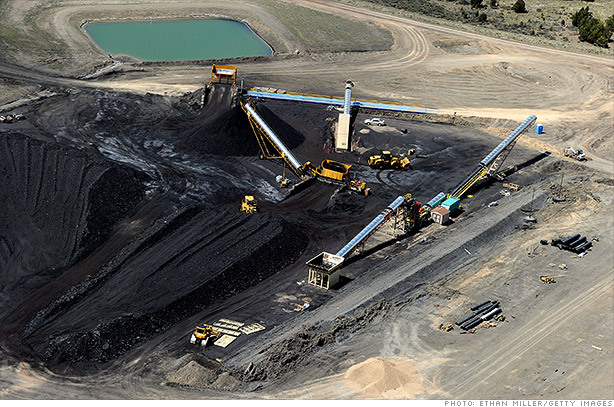 Coal companies, which had a nice jump ahead of the election, saw the sharpest declines. "If there was a Romney trade yesterday, today is about unwinding those trades," said Greenhaus. Arch Coal (ACI), Alpha Natural Resources (ANR), Peabody Energy (BTU), Consol Energy (CNX), and Walter Energy (WLT) all dropped more than 5%. Related: Did Obama kill coal jobs? These companies have had a tough run in 2012 as cheap natural gas has lowered domestic demand for coal. Arch Coal and Alpha Natural Resources are both down more than 40% this year. The effects of the Obama win were less dramatic in oil and gas stocks, which also sold off. Exxon (XOM) and Halliburton (HAL) dropped more than 2%. Natural gas producer Chesapeake Energy (CHK) also fell roughly 2%. While Obama's first term coincided with a boom in natural gas, investors worry that his administration could put restrictions on natural gas fracking and drilling, which could hurt the industry. While the Obama administration is perceived as more friendly to so-called clean energy, shares of PowerShares WilderHill Clean Energy Portfolio (PBW), an ETF that invests in clean energy stocks, also sold off, dropping 2% Wednesday.